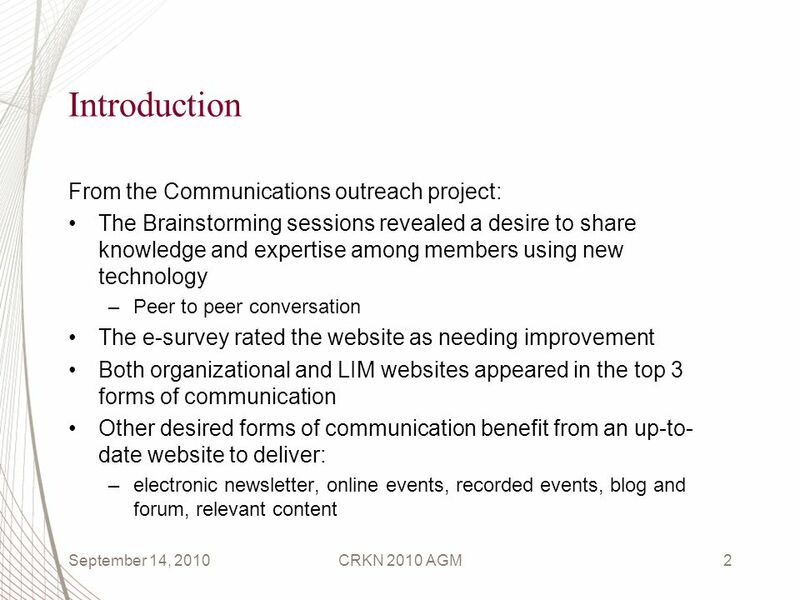 September 14, 2010CRKN 2010 AGM1 INTRODUCTION TO THE NEW CRKN WEBSITE Presenter Dyna Vink September 14, 2010. 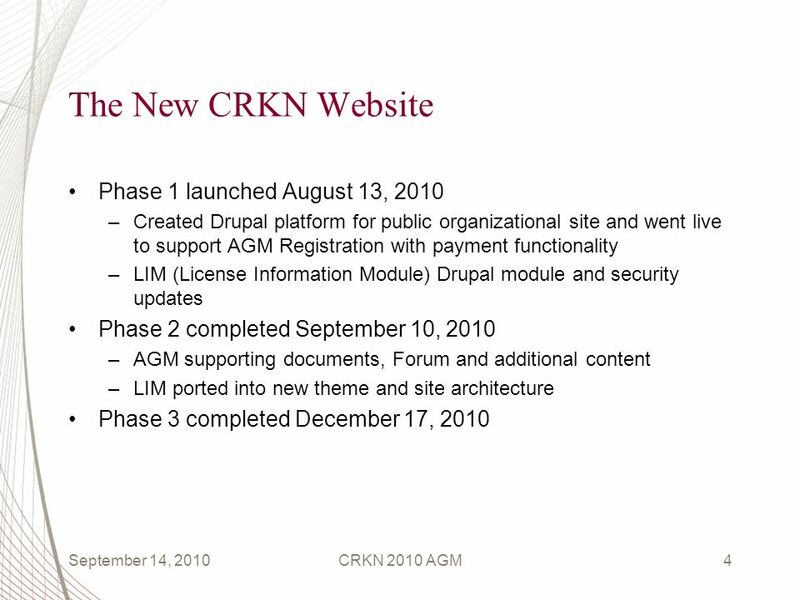 Download ppt "September 14, 2010CRKN 2010 AGM1 INTRODUCTION TO THE NEW CRKN WEBSITE Presenter Dyna Vink September 14, 2010." Program Overview "We heard a number of stories of people deploying SharePoint themselves and then having to call in a Microsoft partner to fix their deployment. E-training on Demand AmeriCorps Best Practices Conference Wednesday, May 6 th, 2009. Knowledge Management at the Gordon – Staff Portal Project Presented by Deirdre Carmichael 12 September 2008. Rapidly Respond to Business Needs Unleash the Power of Microsoft SharePoint 2010 Create a differentiated online experience using SharePoints unified platform! Program Update and Site Redesign Program Update and Site Redesign | Aug 2013. Cisco Confidential © 2012 Cisco and/or its affiliates. All rights reserved. 1 Cisco Partner Plus: Premium Enablement Accelerate Your Competitive Edge. GLOBAL SCI CONSUMER NETWORK: Resources for online communication Frans Penninx (Dutch SCI Association) Sara Rubinelli (University of Lucerne and Swiss Paraplegic. SERVICE SKILLS VICTORIA ( Lencia Evans Industry Project Manager. - 1 - Community building and new initiatives: Laying a successful path and how to be on target experiencing from pitfalls, successes and lessons learnt. Gilles VAILLE PRACSIS REHVA Supporters Seminar Brussels, 10 December 2009 Opportunities offered by the BUILD UP interactive web portal. 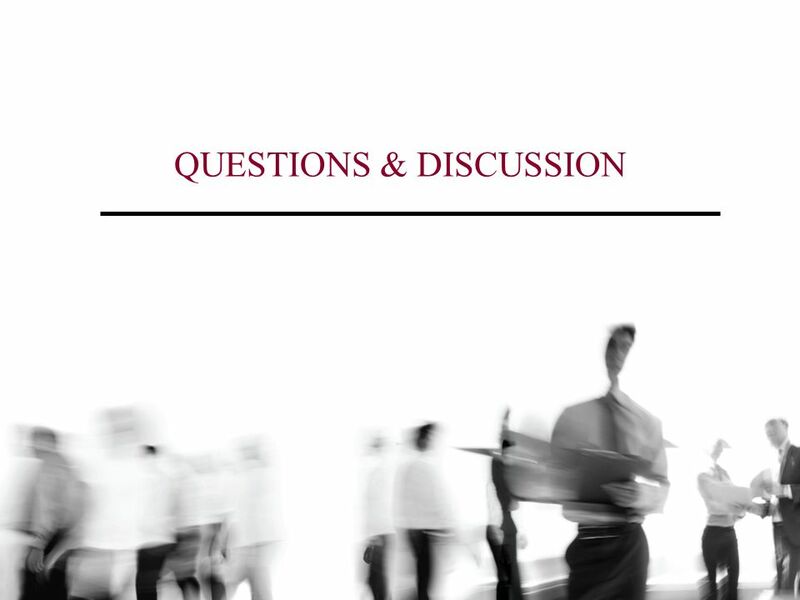 BWA/GE ALL FACES PROGRAM Program Update for Collaborating Organizations September 13, :00 pm EST. SacProNet Sacramento Professional Network 1 Social Media Networking SacProNet Marketing Committee. IASSIST Strategic Plan History of IASSIST Strategic Planning 1990s – Ann Green and Chuck Humphrey – Bill Block, Kate McNeill, Joel. 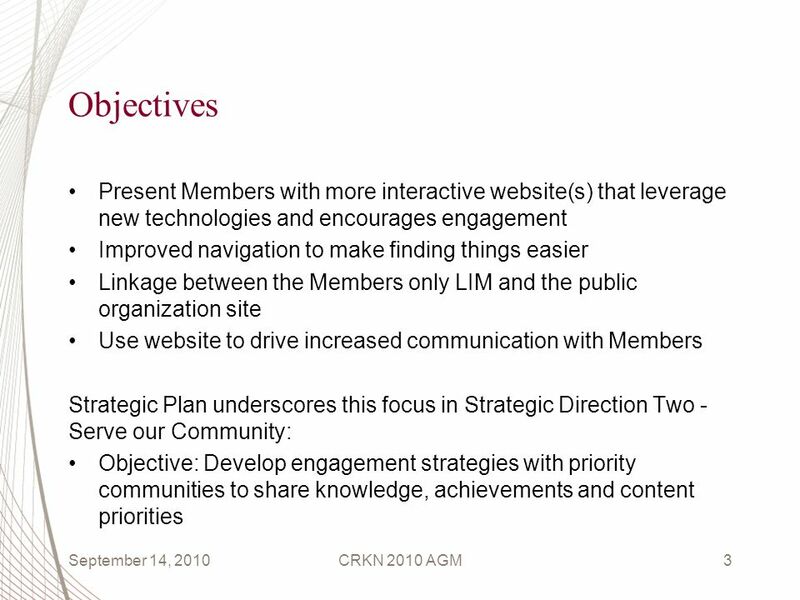 Our aims ease the pain – for all our users get with the times better communication with our supporters recruit and engage people to our campaigns raise. What is Web 2.0? Purpose of web 2.0 in Education. Content Management Systems Why to use. And, if you’re going to use one, which one??? SAS Project Insight Planning Session 1 Good Morning!